Long before The Flash #120 showed up in my mailbox, a letter arrived. A letter from New York City. A letter from Julie Schwartz. Julie Schwartz the editor of The Flash. I can’t seem to recall the circumstances involved with the letter’s arrival, so I’m figuring I must have fainted. In the letter, Julie informed me that the letter I had sent to him would be appearing in the June issue of The Flash and that I had been awarded the original artwork for the story “The Doomed Scarecrow”! I don’t know how I avoided just having a stroke right there on the spot. The DS story was fourteen pages of beautiful Infantino/Anderson art and if you want to know what that means, scroll back and check out the post for issue #118. And not only was it amazing and beautiful, but it was going to be mine! So now you know why that issue was so superspendiflous. I love how Julie addressed me in the letter as Mr. Batiuk. Julie treated his young readers as adults. He made you matter. 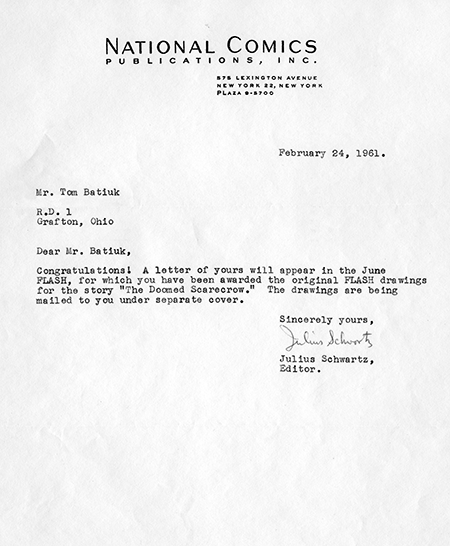 I must have read that letter several hundred times or more the rest of that day and evening. I had heard from Julie Schwartz, I would be getting artwork from Julie Schwartz, and a letter of mine would be printed in the Flash. I thought back to the Saturday afternoon I had spent composing my letter. Not a bad afternoon’s work. I then went back to Julie’s letter, this time focusing on National Comics address in New York City… and a plan began to form.